By all appearances, Beijing looks on track to become the world’s largest and most productive economy in a few years. Furthermore, if the One Belt, One Road project is passed, then the Chinese Communist Party and strongman Xi Jinping will be the undisputed masters of Eurasia and most of the world’s busiest ports. Even President Donald Trump’s current “trade war” with China does not seem to pose a huge threat to a future Chinese-dominated globe. According Professor George Magnus of the China Centre at Oxford University and the School of Oriental and African Studies, there are plenty of reasons to be suspicious of a Chinese takeover. Red Flags is all about the myriad ways that the Chinese economy is neither powerful nor stable. Indeed, Magnus’ book predicts that in the coming years, this economic titan may be headed for a serious crash. Now, readers at this point should be a little wary. Western experts have been predicting various things about Communist China since 1949. Arguably the biggest mistake was the belief that after Mao’s death, China would liberalize. Under Deng Xiaoping, the Chinese economy did liberalize to an extent, but, as Magnus shows in this book, the capitalization of Chinese markets did not mean that the CCP kept its hands off. Rather, the CCP has always played a large role in directing the economy, and most private companies in China are actually owned by the Chinese government. monopolies while also living under European, American, or Japanese law, not Chinese law. This century has never been forgotten by the Chinese, and indeed the staying power of the CCP is due in large part to the rhetoric of Mao and his successors about how the party gave China back its sovereignty and prestige. While Magnus agrees that foreigners did economically exploit the Chinese, he also notes that they modernized the formerly backwards Qing Empire, and, thanks to British port cities like Hong Kong and Singapore, Communist China managed to join the global capitalist world by the 1960s and 1970s thanks to beneficial trade agreements. Now, in modern day China, despite all of its success, there are still some major economic problems that have been a part of Chinese life since at least the Ming Dynasty. First of all, corruption remains endemic despite regular anti-corruption purges. Second, debt holdings make up the majority of China’s GDP (gross domestic product), and according to all indicators, the state of the Chinese economy in 2018 looks a lot like the Japanese economy just before 1990 and the American economy just prior to the Great Recession. Other major problems in China include its aging population (the oldest in the world), stalling Renminibi holdings, the CCP’s almost single-minded focus on being the world’s leader in technology, an addiction to constant growth, and the very real possibility that President Trump’s trade war might convince American investors that China is untrustworthy and should not receive their dollars. Most important of all, Magnus believes that Xi Jinping’s decision to renew the autocracy of the CCP will stifle innovation and further centralize the Chinese economy. Magnus makes many assumptions in this book. Chief among them is the fact that liberal capitalism is the optimal economic structure. Magnus strongly supports freed trade, a fact which calls one to ask this simple question: if freed trade and liberal capitalism are so obviously good, then why has every government in history participated in some form of protectionism and/or nationalization? Even nineteenth century Britain, which is often held up as the great capitalist empire of history, cannot be called a truly free trade economy. Magnus’ other problem in Red Flags is that he noticeably underplays the savagery of the Mao regime. Yes, China modernized under Mao, but it did at the cost of between 40 and 50 million lives. Only a cold-blooded economist could skip over such a fact. 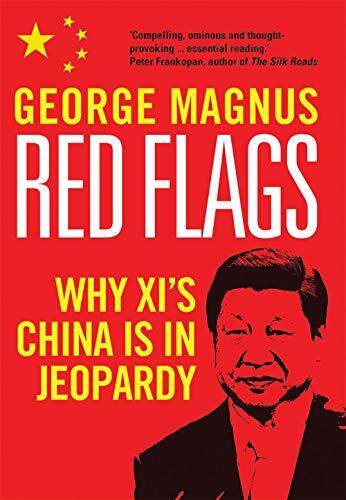 But, besides these issues, Red Flags is a timely and important read that deftly shows how China’s economic power may be just a passing illusion.